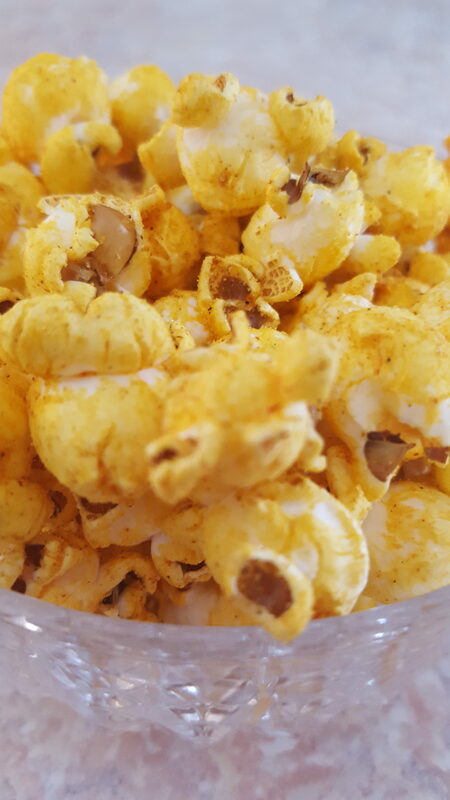 This past summer, Trader Joe’s launched a new flavored popcorn. In my opinion the world can’t have enough vegan, flavored popcorns. 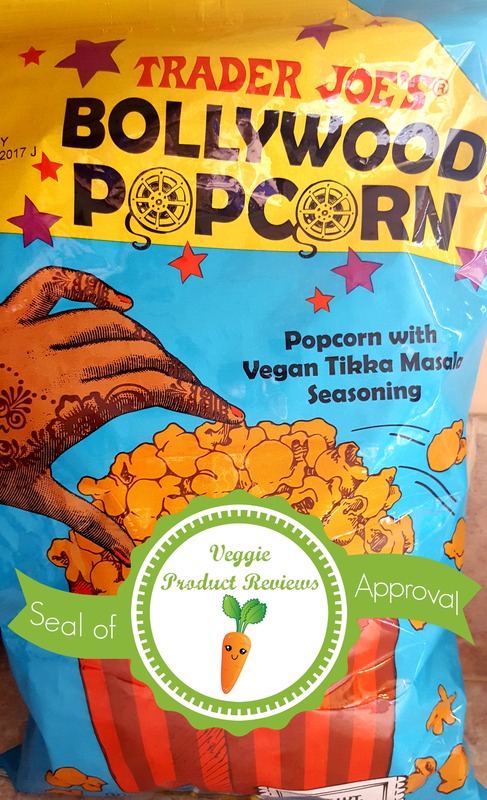 I was reading TJ’s product description and they say: “You might not know you’ve been craving Indian-spiced popcorn, but once you taste Trader Joe’s Bollywood Popcorn, you’ll wonder how you managed to make it this far without it.” I wholeheartedly agree. This has quickly become one of my favorite snacks. It’s like eating a hearty Indian dinner and a movie snack all at once. The spice haters leave more for me. What? You’re still here instead of rushing out to get a couple bags? Ok. I’ll make up a con. When you tell someone who is hesitant of spice that it’s spicy, they won’t believe you because it looks so cheesy. They will find out you are telling the truth and possibly knock you down on the way to the water. I am a North Carolinian through and through. I wasn’t born here, but I’ve lived here for most of my life. I’ve got the accent which gets worse (read: better) when I’m tired. I’m ok with the hot summers. I like staying home for the one good snow we might get in the relatively mild winters. And, there’s nothing quite like southern food. Smoky, sweet, spicy…it all works. 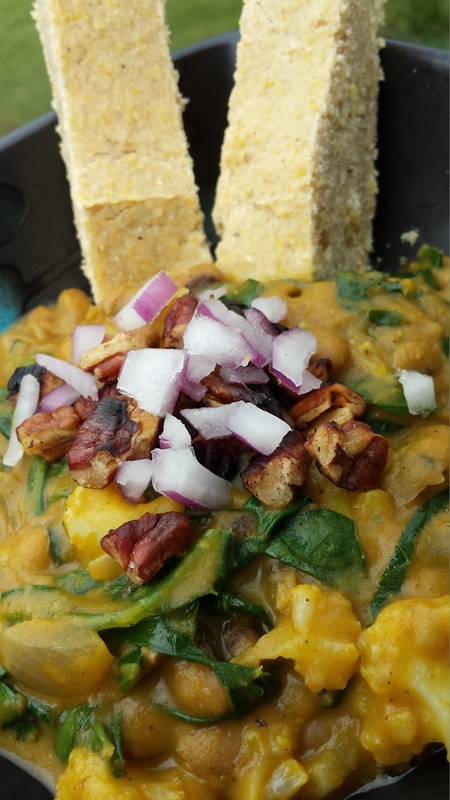 So, for today’s post, I’ve decided to mix a little North Carolina in with a coconut milk curry. And what’s more southern to soak up some of the liquid than a a little fresh-baked cornbread? First off, let me tell you a little something about black-eyed peas and collards. They are the essence of NC cooking and I never liked them growing up. The real truth is I never ate them. Although I grew up here, my parents didn’t, so we never had them at home, and I guess I was afraid of them at all the reunions and church potlucks. In the last couple years, I’ve learned to love the black-eyed pea, but still had a little fear of collards. Until now. I loved this dish so much that it, and variations of it, will be in my regular rotation from now on. I didn’t really measure anything to make this dish because who wants to work that hard for curry? But, I can tell you what I did to give it that NC spin. First cook some diced red onion in a little oil in a large skillet. When they are translucent and start to brown, add in some of your favorite mild curry powder (I used this one) and stir to coat the onions. It’s better to err on the side of too little curry powder as you can add more later. After about a minute, add the black eyed peas, some small florets of cauliflower and about a cup of water. Add in a golden broth cube (I used Not Chick’n) and use a fork to break it down into the water. Once the broth cube is dissolved, add in a can of coconut milk. And, here’s that little bit of sweet…add in about 1/2 can of pumpkin puree and stir it in with the coconut milk. Taste the broth to see whether it needs more curry powder or salt and add to taste. If you need salt, I highly recommend smoked salt. It adds a little extra something. But, if you don’t have it, regular salt will work just fine. Bring to a boil, cover, reduce heat to a simmer and let it simmer until there’s little liquid left (it took mine about 15 minutes). Add a bunch of collards, chiffonaded and about 1/2 cup of water to thin out the curry and cook the collards. Use more if you like it thinner. Serve topped with toasted pecans (more NC), and finely chopped red onions. Sprinkle on more curry powder/smoked salt as needed. 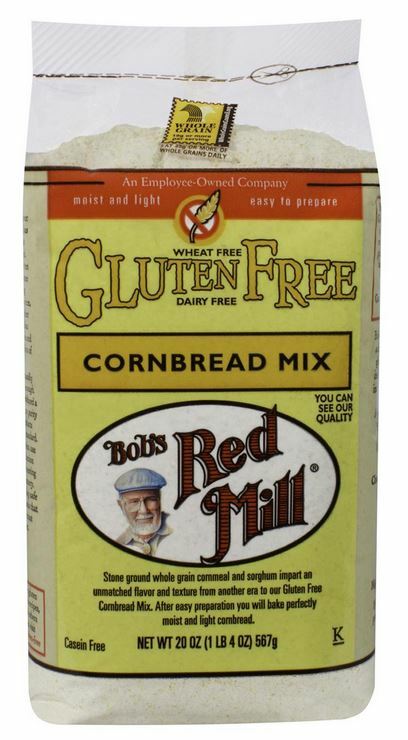 To keep the NC flavors going, I tested out the Bob’s Red Mill Cornbread Mix. The mix calls for eggs, but I tested it out using “chia-eggs” (1 Tbsp ground chia to 3 Tbsp water) I used white chia to affect the color as little as possible. It has a mild, slightly sweet corn taste, but I like the corn to “jump” out at me a little more. The flavor was better against the curry (seemed sweeter and more corn flavor) than it was on its own. It’s a little on the dense side (a lot on the dense side if you like the muffin-y almost cake-like cornbread that you get from some mixes). Although I typically like room temperature baked goods, this is better warmed up. Noting that it may be different using actual eggs (which we don’t do here at Veggie Product Reviews), my review is that it’s decent, but nothing to write home about. I’d rather have my homemade, but it will work when I’m in a hurry. Until next time, Julie, Amanda and I would like to thank you for spending time with us this Vegan MoFo. We look forward to hearing from you as we review products throughout the year. I’m not the biggest fan of road trips. I don’t like being in the car for hours and I don’t like sitting still. Unless I’m the driver, I usually sleep because the car puts me to sleep. I sometimes get carsick and sleeping helps me remedy that. And if I’m in the backseat, I have to wear Sea Bands or I’m likely to get nauseated. A trip of 3 to 3.5 hours is my happy limit and even then I get antsy. I’m pretty sure I was an excessive “are we there yet?” kid. What is that you say- you want to stop? Don’t even think about stopping often because that only prolongs the time you will reach the destination. I stop only when my bladder is about to explode (unless the baby needs me to stop, then I will). For this post, I am imagining a road trip. Maybe one where I’m in a big van with awesome gas mileage comfy seats, good music, great company and delicious vegan snacks. Oh! And on this road trip, we pass by a ton of vegan restaurants with extensive gluten free options. In the south that includes decadent biscuits and gravy! I also envision northern pizza places with homemade gluten free dough and amazing vegan cheeses and endless toppings. Vegan mac n cheese? Yes, please! Maybe this road trip isn’t so bad after all. Half eaten bag of Sam’s Harvest Jerky. 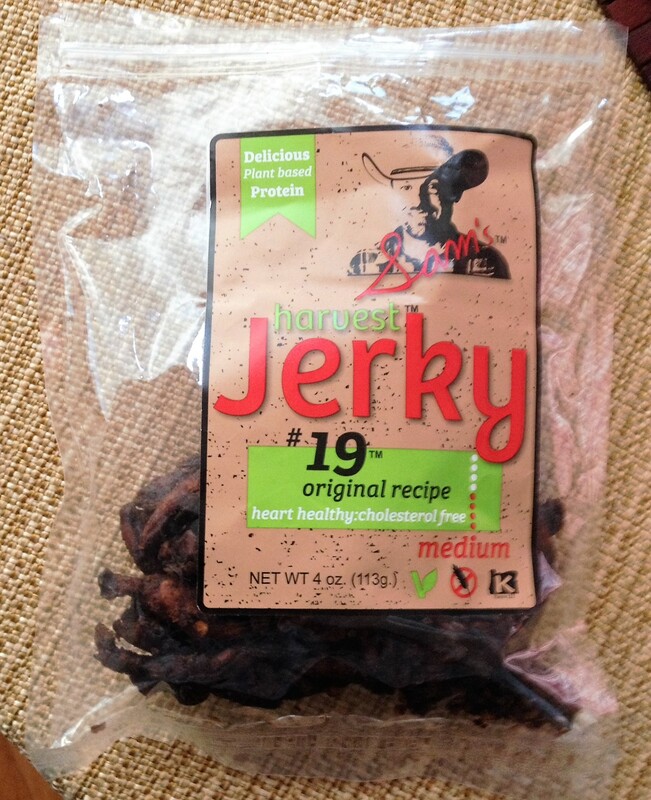 My packed snacks are sure to include Sam’s Harvest Jerky by Butler Foods. I recently purchased this jerky online and loved it from first bite. It has a chewy deliciousness that makes it hard to put the package down. I had to control myself so I didn’t eat the whole package in one sitting. This product is made from Soy Curls and the pieces are a generous size. I didn’t find that this jerky was too salty, which is a huge plus for me. I don’t like things overly salty. My only complaint is that I have to buy it online and can’t find it in stores locally. I’d love to be able to buy it more often. Happy Vegan road-tripping and happy MoFo’ing! Who can believe we have less than a week left in Vegan MoFo? September has flown by! Today’s MoFo prompt encourages us to tell you about our favorite herb or spice. This was a super easy decision for me. 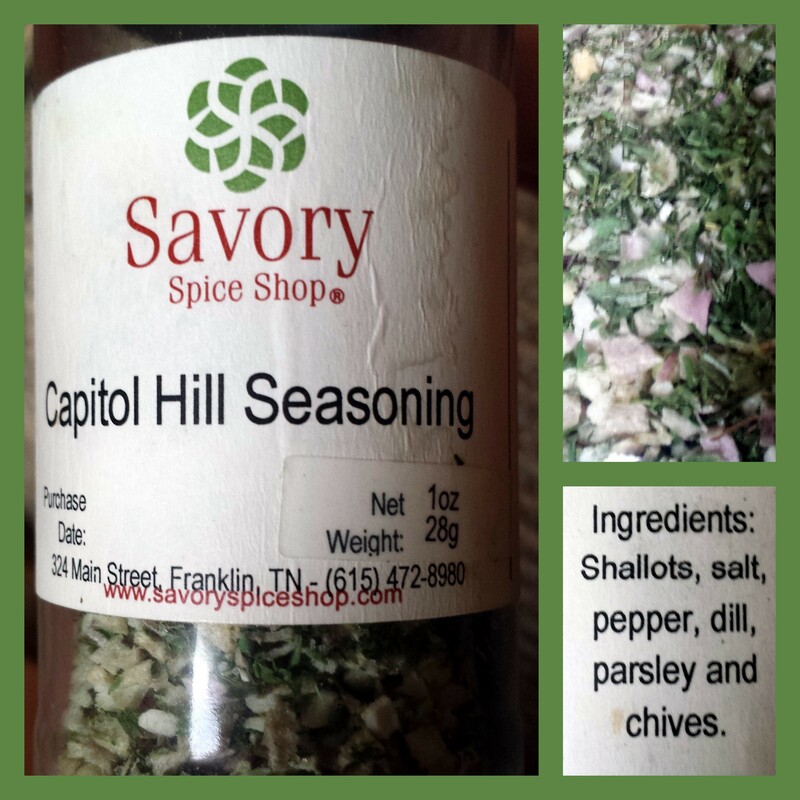 Mine is actually an spice/herb mixture called Capitol Hill Seasoning from Savory Spice Shop. 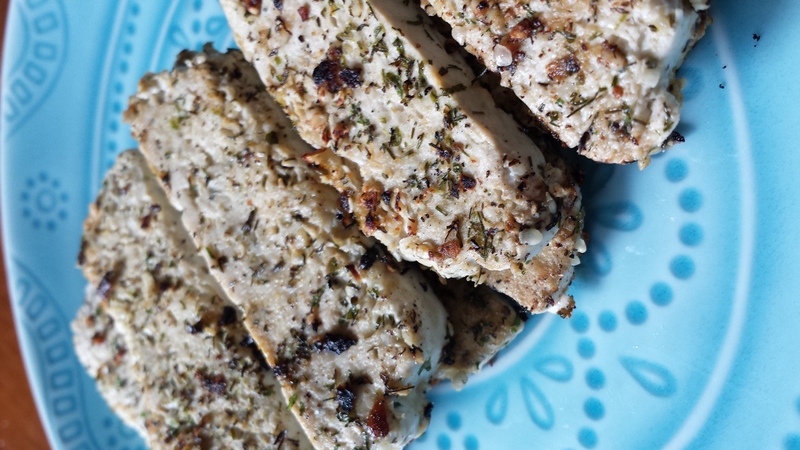 It’s a perfectly savory mixture of dried shallots, salt, pepper, dill, parsley and chives. As you can see from the photo below, my bottle is well-loved. My first use of it was on a cashew and asparagus dish, that Savory Spice Shop adapted and shared on their website. A couple years later, I’m still finding good ways to use it. I like it stirred into Earth Balance for an herbed “butter.” It’s good cold for spreading and good melted for pouring on popcorn. It’s a good mixture to encrust on tofu (for me, it’s the original variety of Living Harvest’s Hemp Tofu). One of my newest and favorite ways to use it is to make a quick ranch dressing/dip. I realized that is everything in it that I added to my homemade ranch except for garlic. So now, I make up an individual serving of dressing by taking a spoonful of soy-free Vegenaise, adding Capitol Hill Seasoning and a little garlic powder to taste, then thin it with water or non-dairy milk. Quick and easy. In my spice cabinet, aside from the salt and pepper, this has the most accessible spot. I don’t foresee it being kicked out anytime soon. If you haven’t got it in your spice cabinet yet, you might need to remedy that.